with many technological features and now has more advanced features. Web_synergy_green terminal with advanced presence graphic color LCD screen 3.5 inches. This terminal is based on the Linux operating system and can be used through a general application that provides a comprehensive solution for all current systems and access control within the organization. 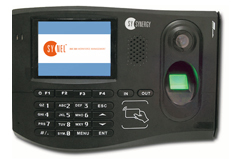 Synergy Biometric time and attendance terminal include a built-in camera 1.3 megapixel, speakerphone, which can be used to alert the accepted or rejected reporting and more. SYNERGY terminal support different types of network organization, as a unit by itself or as a supplement for attendance management system and existing access control.